Horse Management is a judged discipline embedded in every USPC Rally and Championship competition. Horse Management proficiencies are integrated into every USPC Certification, building from the most basic horse-handling skills of the D-1 to the advanced and sophisticated proficiencies of the H-A. Yes, teams must ride well to score well. They must also perform the stable management and horse management tasks integral to keeping their mounts safe and healthy for the duration of the competition and beyond. Every Rally begins and ends with Horse Management scoring as an ongoing component of the competition. * Set-up & Safety plan? Check! So why is it that some teams fly through these basic protocols so well, while others struggle and cannot complete these four worksheets without losing points here and there? No mystery really; the properly prepared teams read and follow the USPC Rules for Rallies and Horse Management Handbook. Seethe 2015 HMH edition for our current version. The HMH is more than just a good idea; it is the “Rules of the Barn” at USPC Rallies! Think of the HMH as a blueprint teams can follow to ensure that they arrive at Rally with the correct and adequate equipment, tack, and supplies needed to care for team mounts for the duration of the Rally. Just as a sound house or stable is built according to an accepted blueprint, sound HM is built on the familiar foundation of the HMH. Ideally, the tools and practices described in the HMH are well-practiced in the club’s ongoing HM educational curriculum by certification level. If your club does not include regular HM study and practice in its program (and please tell one of your local CHMJs if that is the case! ), your team can still find the way to better HM scores at Rally by using the HMH in your daily barn routines at home. No surprises, no hidden agendas. It is all here for your team to learn and to follow at Rally. The place to learn these protocols is at home, in the course of club meetings. Some clubs hold HM practice sessions so that team members become so familiar with the forms that any member, not just the Stable Manager, can discuss the HM expectations confidently. Indeed, all Games team members must learn these procedures, since Games teams do not enjoy the benefit of a Stable Manager on the team. After officiating at numerous Regional Rallies and at Champs West this year, I can offer a view from the judge’s clipboard that could help your team score better in HM at future Rallies. Too often, the same questions and concerns arise, despite the amplifications and explanations in the HMH. Of course, every CHMJ expects Inquiries (see pages 24–25 regarding the HM Inquiry process), but many, many times the answer has already been clearly given in the HMH. The judge, with HMH in hand, will refer the Team Captain and all team members to the appropriate pages in the handbook and the points will stand. During the 2015 Rally and Champs season, CHMJs across the country answered the typical Inquires noted below. Using their experience and guidance, your team can avoid “preventable penalties” and score better in HM. Use this Tips memo to pinpoint precise pages to read in the HMH. Feel free to keep a copy with your team USPC Rules for Rallies and Horse Management Handbook – in print or online. Let’s look at the most common situations one-by-one with a few illustrations to help. See page 53–54 of the HMH for complete information and an approved sample. The information detailed there must be provided for each mount (even “companion horses” if such are allowed at your Rally and stabled with your team). Yes, creativity is welcome; remember that the required information is required, regardless of format. Overlooked details often include: the team name, when a scramble team is assembled; the mount’s accurate height; the chaperone’s mobile phone number; and the competitor’s number. Note: “Companion horses” are defined as any mount(s) present in the team’s stabling area but not competing at the Rally. This includes lay-overs awaiting shared commercial shipping. See page 55 of the HMH for an approved sample. The most-often overlooked items include: stall number; competitor number; supplement amounts by weight (not “scoop”); and medications. See page 58 of the HMH for the checklist. Read and learn pages 31 through 51 (“Amplifications”) of the HMH. One kit is required per mount (required and scored for any companion horses). No sharing is allowed due to health and hygiene concerns. 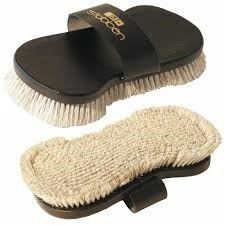 Grooming tools must be clean and in good enough condition for vigorous daily grooming. Dirty rub rags will incur penalties! 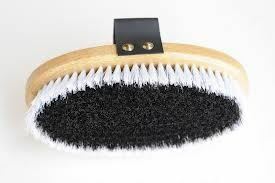 An acceptable currycomb is one that can be used to curry the coat and must be useable for cleaning the dandy and body brushes as the competitor grooms the mount. See below. A metal curry may also be included to clean the bushes, provided that a curry similar to the above illustrations is used on the coat. Shedding blades are not acceptable as curries. 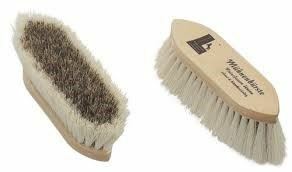 An acceptable dandy brush carries stiff to medium-stiff bristles, typically long enough to reach the skin through a full hair-coat, and useful to remove heavy dirt or dry mud and sweat/salt marks. 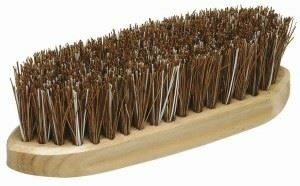 Bristles may be natural or synthetic; the back may be natural (often wood) or synthetic. See below. 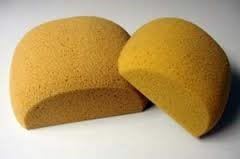 The acceptable body sponge is B-I-G. It fills your hand and holds enough water to actually wet the mount’s back completely in just a few strokes. 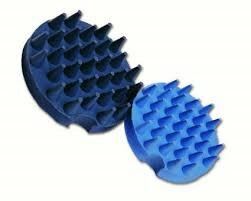 Small spongers suited for eyes, nose, dock, or for cleaning tack will not pass as body sponges! Any style (“turtles” as in first photo, or contour/hourglass or big blocky sponge) is OK. Do not cut a large one in half at the last minute to cover for a forgotten one; both kits will then incur a penalty … See below. 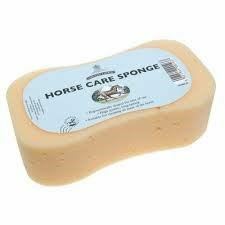 Rub rags are intended to truly rub down a damp horse, or to polish a coat and distribute the natural oils across the hair-coat. Size matters! Choose one large enough to fold or wad into working size. Be sure the texture is not abrasive in any way, and the rub rag must be clean. Stains and filth incur penalties. The purpose of Extra Equipment is to have at hand the emergency replacement for tack broken or damaged in the course of the Rally. It is not acceptable to substitute Extra Equipment for forgotten or unacceptable gear. Extra Equipment must be safe, clean, supple, and correctly sized for all mounts on the team. This may mean one set for ponies and another set for horses if the team is mixed in size. All such Extra Equipment must be on-hand and ready for use when the RE check is done by HM. See the worksheet on page 57 of the HMH. 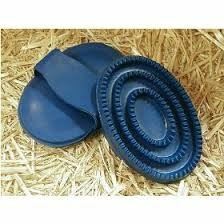 Remember to walk into and inspect the mount’s stall before laying the bedding. Remove nails, screws, etc. to protect the horse. Ask an HM staffer for help if you are unsure about the stall’s safety. Hang water buckets at approximately mid-chest height for the mount’s comfort and ease. Install the complete and correct Stall Card as soon as the mount is in quarters. Correctly fitted breakaway halters are required. Full leather is not. The lead rope may be separate or braided on when a competitor is present with the mount. The halter must be clean and supple enough not to irritate the horse for the duration of the Rally. The lead cannot be broken, jammed shut, or dangerously frayed. Recall that USPC insurance stipulations mean mounts will remain haltered for the duration. Most mounts do not wear halters full time at home, and a braided-on lead cannot be left unattended, so plan ahead. Accustom your mount to long-term haltering and have a safe lead rope at hand. The lead must be hung near to the stall door, but away from the mount’s prehensile lips. Rally constraints determine Feed Room locations, and sometimes the team will hike to its feed trailer. Complete and correct Feed Charts are posted there. Stable Cleaning Equipment is kept ready for use in the Feed Room/ Trailer. Top-off Buckets also stay when they are not in night-time use outside each occupied stall. One reasonably-clean (no caked, old feed) heavy-duty feed tub is required per mount, unless no grain or supplements or loose salt is fed to that mount. Heavy-duty means thick and strong enough to withstand the eager horse or pony that may toss the too-soon-empty tub around the stall. A typical feed tub is made of flexible quarter-inch rubber woven with synthetic filaments that reinforce the rubber. Unacceptable “feed tubs” include dishpans, tack-cleaning buckets, wash buckets and the like regardless of the mount’s size. Ponies are hard on their stable gear, too, so ask an HM staffer if you are unsure. See the work sheet on page 59 in the HMH. See page 8 regarding competitor Attire for Horse Inspections. Rider, Tack and Mount columns are noted for comments or possible penalties. As noted on the worksheet, tardiness or failure to present may be penalized. Inappropriate attire is likewise penalized. All mounts must pass the in-hand Horse Inspection before they are allowed to compete under saddle. See pages 61 through 63 in the HMH. See page 9 in the HMH for Proper Attire for Turnout Inspections. Turnouts are judged to the HM Certification level of the competitor. For example, a C-1HM/D-3Trad is judged at the C-1 Turnout level. Note the penalty -point spread by certification level for each team member so that all of you understand the Rider, Mount, and Tack categories. The most important factor is to be on time. Most Rally Organizers now assign a Timekeeper. Sign in with that person to ensure that you are noted as being on-time, even if the judge is delayed by a previous competitor or an emergency. If no Timekeeper is present, position yourself so that the judge is aware that you are on-time. Your Stable Manager or another team member may continue to do touch-ups until the rider is summoned for presentation. Once the rider presents her/himself to the judge, the Stable Manager may observe but not participate unless so requested by the judge. See page 22 explanation and page 65 worksheet. Safety checks are mandatory. Note that the Ground Jury may eliminate any rider who mounts and rides without a Safety Check. HM points will accrue if elimination is not required by the Ground Jury. See pages 22–23 for explanations and pages 60 and 64 for worksheets. The HM Daily Sheet provides judges the place to make comments in the three general categories of daily HM: Stable & Tack Areas, Care of Mounts, and Overall Impressions/Teamwork. Additionally each day’s form consolidates the comments/points from applicable separate worksheets such the Safety Check and Turnback Inspection sheets. Turnbacks are judged one hour or more after the final ride of the day per competitor. Like Turnout Inspections, Turnbacks are judged to the HM Certification level of the competitor. For example, a C-1HM/D-3Trad is judged at the C-1 level. Rider, Tack and Mount are evaluated; with “properly cared for” as the benchmark the judge expects. See the chart at the top of page 23 for guidance on expectations. See pages 24–25 of the HMH regarding the HM Inquiry process. You can catch more flies with honey than you will with vinegar. CHMJs often hear some variation of, “It passed at my last Rally. It must be OK now!” when a team disputes penalty points. The CHMJs as a group have met annually for the past three years to share concerns, perceptions, and clarifications of the rules and scoring. We are determined to keep improving the process for HM at Rallies and at home. One of those improvements is the standardization of HM judging everywhere in country, so that HM in Alaska or Alabama or Kansas or Kentucky is the same fair process nationwide. At each Rally, the CHNJ(s) review every worksheet, whether prepared by an Assistant or themselves, to provide consistent and fair scoring and offer written kudos or comments for improvement. If, at some past Rally, your team was evaluated by a judge who did not recognize an omission or forgot to look at something, you got that “one free pass,” despite the direction in the HMH. Thus, appealing to past luck is not a sustainable defense. To sustain an Inquiry for relief of penalties, the team must be able to show that the alleged short-coming actually was not a penalty -point situation, because the competitor/team truly did meet the stated requirement (s) in the HMH and/or the required certification proficiencies for the level in question. Accurate and safe HM as outlined in the Standards of Proficiency and/or the HMH is defensible and is a team’s best option when pursuing an Inquiry. Do your research first! Then come prepared to calmly and respectfully request reconsideration of the penalty. Unless otherwise specified, (e.g., US Pony Clubs, Inc. educational purposes) all information and instruction contained herein including documents, services, design, text, graphics, logos, proprietary images and icons, as well as the selection and arrangement thereof, are the sole property of Circle Wing/Alane L. Alchorn, Copyright © 1980–2016. All rights not expressly granted herein are reserved to the author. Except as otherwise required by applicable law, any reproduction, distribution, modification, retransmission, or publication of any copyrighted material is strictly prohibited without the express written consent of the copyright owner, or legal heirs and assigns. Contact Alane at circlewing@aol.com with specific questions.